This Blog Celebrates A Birthday…And So Does The Man Who Dislikes It! This blog is FOUR guys! That means we’re [probably] potty trained and [probably] tying our own shoelaces, unless you were one of those cool kids with velcro straps on your TMNT kicks. Whatever. Not jelly. Anyway, thank you all, as always, for keeping this blog, and me, going. Your support is everything. Ok. Let’s talk about Easter desserts. Specifically, let’s talk about macabre Easter desserts. Whilst searching the ‘nets for some inspiration, I came across a few pretty dark-sounding sweets. Let’s list them, yes? 1. Empty Tombs. Which, as I remarked to a friend of mine the other day, is probably a step up from “Tombs Filled With Sleeping Jesuses,” but is still not something I could see myself enjoying. 2. Chocolate Crosses. Again, not totally sold on the whole “eat a symbol of suffering while feeling really good about the sugar you’re imbibing” thing. I dunno. 3. Judas Cookies. To be fair, my friend Jeremy had the idea for Judas Cookies, which I suggested should be topped with chocolate Judas kisses, and then we had to stop before all the Catholics we both know (and some we don’t) came after us with Super Soakers full of holy water. (There’s mad blasphemy all up in that sentence, isn’t there?) My mother alone could form a very, very formidable army of such soldiers. 4. Bonkers Easter Cake. WHO WOULD COMMIT SUCH AN ATROCITY?! So, I decided to go for something a little bit more classic. Ok, fine, full disclosure: this post is going up a couple of days before Easter, so y’all know I didn’t really make this for Easter. This was actually a birthday cake for my dad, who normally hates, in no particular order: cakes, blogs, things that are made from scratch, things that are made from scratch and then blogged about, cakes that are blogged about, and his child blogging about cakes she made from scratch. Dad will very likely end me if he finds out this picture is on the internet, but seriously people: check out that swagger. Dude is holding an infant and cutting a cake like it’s NBD. I’d have trouble doing one of those things with total confidence. 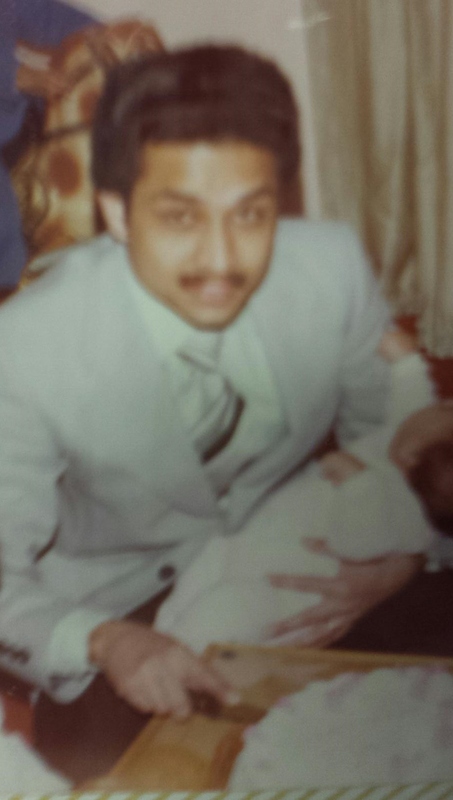 A lot of people have asked me how it feels to have my dad not like my blog. Those same lot of people are always shocked to hear me say that I think it’s HILARIOUS. He’s such a grump over the most random issues (see: cake-making, also the clothing choices of complete strangers and when people lose on Wheel of Fortune) that it starts to get very amusing after a while. He’s also my dad, the guy who– no questions asked– came over to my apartment a few years ago when I was living alone in order to kill a giant waterbug for me– which I originally claimed was a bat, it was that large– because I was too scared and squeamish to do so myself. He’s the guy who drove over to my apartment last week to pick up my boyfriend and me after our apartment became uninhabitable for a few days (remember that awful varnish smell I mentioned? ), and then left us with to-go breakfast sandwiches when it was time for us to head home. He’s the guy who happily secured tickets for five brown people who inexplicably wanted to see Tom Jones in concert in Atlantic City in the mid-1990s, and I am still weirdly proud that it was the first live show I’d ever attended. So, despite the fact that you may very well never read this, I thank you Papa K, for making life funnier, more stressful/less stressful, and safer from disgusting insects/life’s other random villains. Still, like I said, the man does not normally enjoy cake. BUT! There is an exception, friends, and it is an exception so simple and yet so profound, that even I in my all-powerful wisdom (LOL) could never have guessed it: carrot cake. 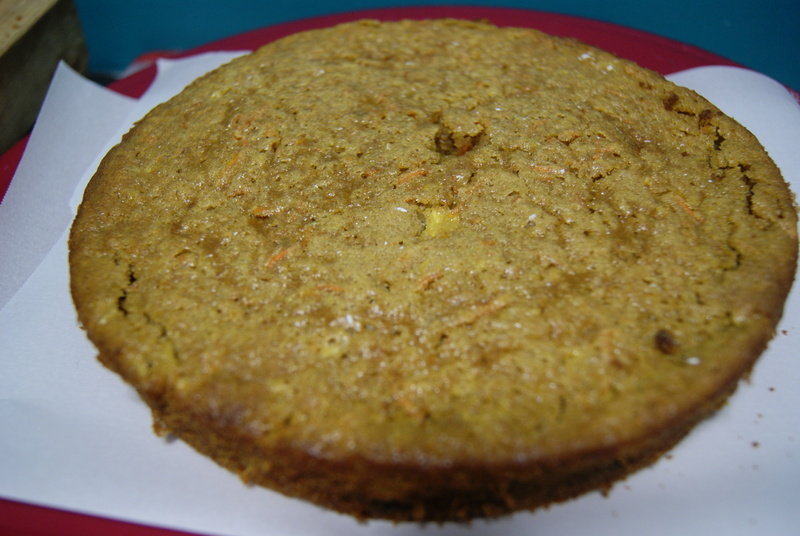 Regular old carrot cake. Well. Not so regular, and not old at all, but it is more classic than the one I’ve made before. Let’s do this. To start, preheat your oven to 350ºF. Generously butter and flour two 9-inch round cake pans and set aside. In the bowl of a stand mixer or in a large bowl with a hand mixer, beat together butter, oil and sugar on medium speed until fully blended. Add in eggs, one at a time, until completely mixed. In a separate smaller bowl, sift together flour, cinnamon, salt (if using), baking powder and baking soda, then add in vanilla. 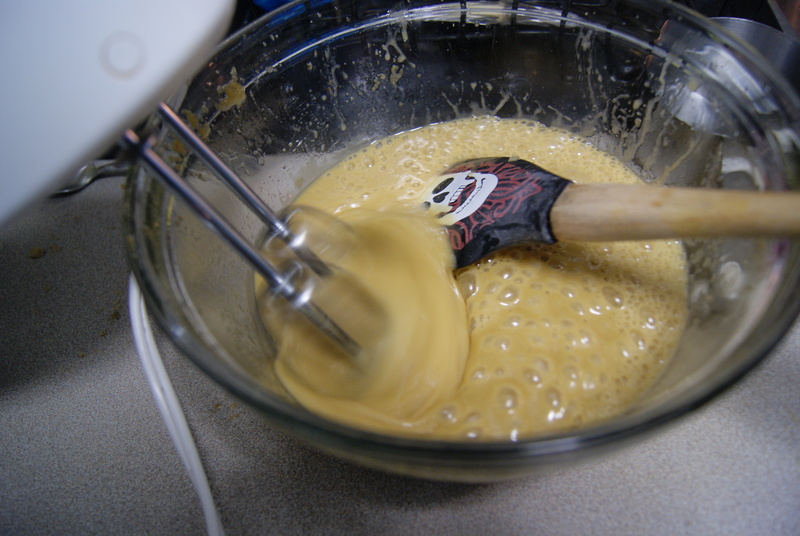 Gradually add flour mixture to wet mixture, with mixer on low to medium speed, until batter is fully mixed. 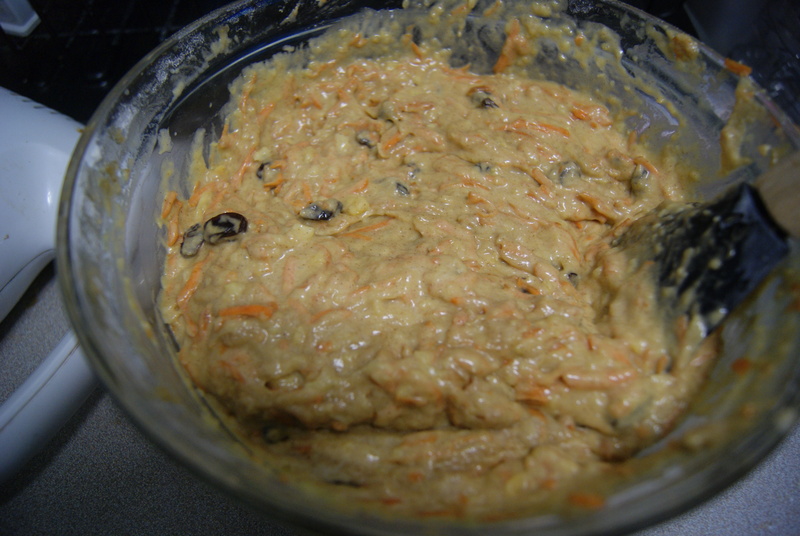 Fold in raisins first, then pineapple, then carrots, until evenly distributed throughout batter. Divide batter between pans and bake for 30 to 35 mins, until a cake tester inserted into the middle of cake comes out clean. Allow cakes to cool in pans for 10 minutes before inverting onto cooling rack to cool completely, about 1 hour. 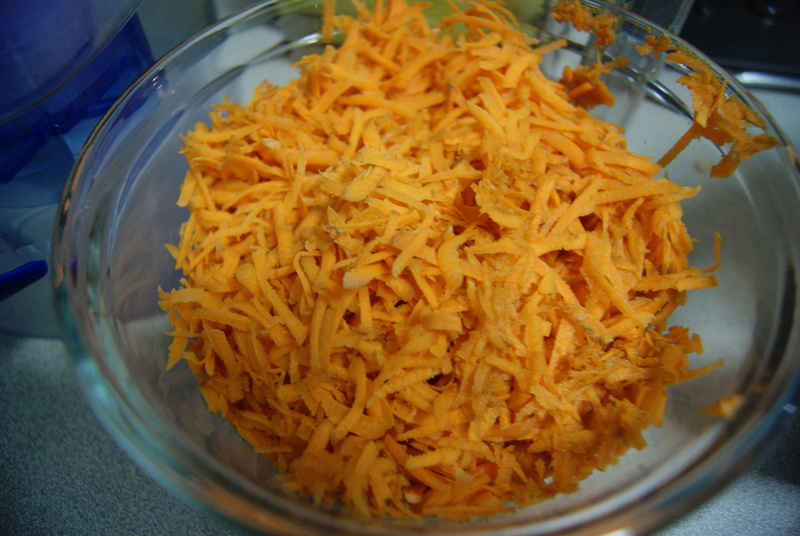 To make frosting, beat cream cheese and butter together with a mixer on high speed until blended. Add in milk, a little at a time, then gradually beat in sugar and vanilla until mixed. Note that this recipe will produce a cream cheese frosting that is on the tangier side, because no one in my family likes it to be terribly sweet. If you prefer yours on the sweeter side, add in about 1-2 more cups, a little at a time, tasting as you go until you reach your preferred level of sugar shock. Frost the top of one cake round, then top with second cake round and frost. Decorate how you wish and serve. Thoughts? I’m weirdly surprised at how well this went over with everyone. My dad being my dad, he did question why I’d spend the time baking something that seemed complicated to him from scratch…until he tasted it. 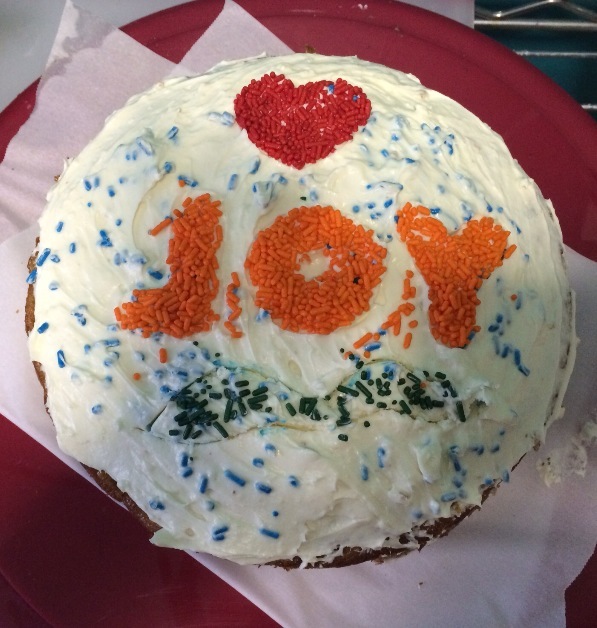 In fact, everyone was really happy with the cake, from the tangy frosting to the rich, not-too-sweet actual cake. I was pretty damned shocked to hear that my parents, who aren’t really big sugar fiends (yes, I know, I also suspect I was adopted) polished off the rest of this cake a couple of days after dad’s birthday. You never cease to surprise me, Pops.